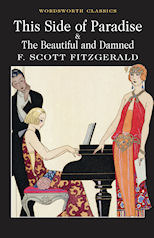 Continuing with Fitzgerald, I could only hope that The Beautiful and Damned would be a somewhat more satisfactory read than his debut novel. Seeing as the blurb given for the second novel in this collection had at least a modicum of plot mentioned beyond "here's this guy's life-story", I had a bit of hope that it would be less tiresome. The Beautiful and Damned follows Anthony Patch, a romantic young man who is due to come into an inheritance of millions when his grandfather passes, if only he can live with some measure of respectability. But this will turn out to be much harder than he imagines, with his marriage to the beautiful and indolent Gloria marking the beginning of an existence typified by living beyond his means. This novel is almost everything I want in a story set in the 1910s and 20s. It is a bleak but beautiful picture of a society that cannot sustain itself under its own hard and fast living. Anthony is not much different in character from Fitzgerald's previous protagonist Amory Blaine initially, but the thing that made The Beautiful and Damned work with a protagonist of this type is that Anthony actually seemed to suffer for his poor choices. Whereas Amory's slide into poverty is accompanied with a surprisingly blase attitude, Anthony doesn't cope in the slightest with being unable to live as he was accustomed to. Throwing himself into weekend-long parties that he can't afford, but can't bear to go without, it's not long before he's sucked into a self-destructive spiral of debt. To have an actual character arc to follow is so refreshing after the meandering that hampered This Side of Paradise. The Beautiful and Damned is not a perfect novel though, as there are points where it feels more than a little padded and it's still a bit meandering at points. But it captures that self-destructive undertone that fascinates me about the early 20th century perfectly and I would happily recommend this novel to those interested in Fitzgerald's work or that particular era in history.